Kreative Jewels: Love Ya Bunches! For this month's Creative Construction with Blueprints challenge we are featuring circles. I don't know about you, but I love using circles in my designs. I paired the Blueprints 18 Die-namics with the Cheeky Monkey stamp set to create this sweet card. 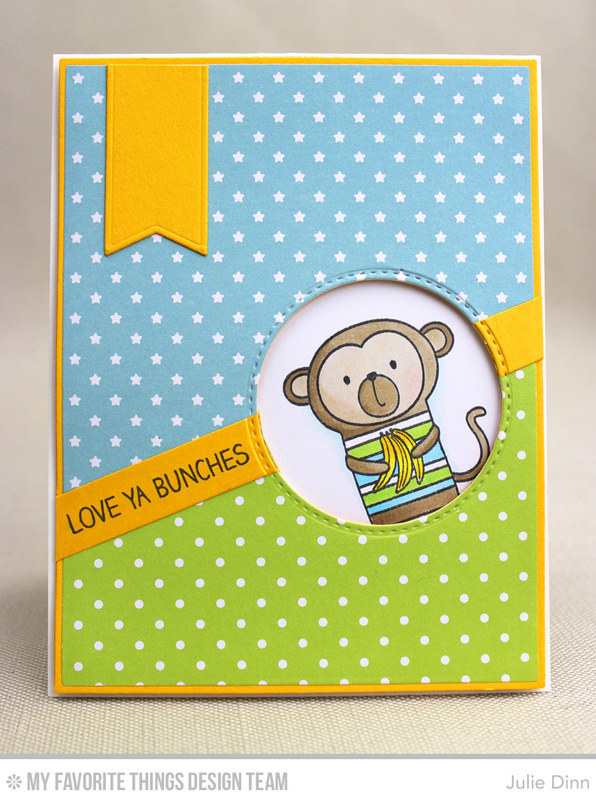 I used the stitched circle from the Blueprints 18 Die-namics to create a peek-a-boo window for the monkey to peek through. The gorgeous patterned paper is from the new Lucky Prints Paper Pack. I just love the small prints and gorgeous colors in this pack. Be sure to check out the MFT Blog to see all the fabulous creations the design team created to share with you today. Such a CUTE card. I love how you used MFT Blueprints and your card design as well as color combination is awesome. Very cute!! I love the colors.